The ‘Art Barn’ part of the Every Barn project is in the hands of Yorkshire Dales-based artist Helen Peyton. Local charity, the Yorkshire Dales Millennium Trust has generously funded her to produce a piece of work that we can reproduce on items such as tea towels, tote bags and mugs. We will be offering these to local visitor businesses in the first instance but would like eventually to be able to sell Art Barn souvenirs to help raise money to preserve Swaledale cowhouses into the future. “As you drive over the pass at Buttertubs into Swaledale, it has to be one of the finest views in the whole of the Yorkshire Dales and I am one of the luckiest people because I have been invited by the Yorkshire Dales Millennium Trust and the Yorkshire Dales National Park Authority to make artwork linked to the cowhouses in Swaledale and the project Every Barn Tells a Story. I start as I always do with any artwork at the museums; my linocuts are based on their collections. I am fascinated by why we collect objects, how our memory and emotions can be linked to them. The stories behind a museum artefact give us a wonderful base to understanding an area, its diversity and traditions. My first visits were to Keld Resource Centre, Swaledale Museum in Reeth and the Dales Countryside Museum in Hawes and between them the wealth of information is captivating. To start with, everything is interesting or beautiful and would make a lovely linocut and I think it is the trickiest aspect of any commission, isolating your interests and just settling on one thing. Immediately I am attracted to cheese and butter production and in particular the butter marks or moulds that imprint a decorative pattern onto the surface, these are particularly pleasing as a printmaker to find something so charming and intricate, similar to the way I cut wood or lino for printing. We’re really pleased now to be able to offer local visitor businesses an attractive display panel sharing some of the stories we’ve collected about cowhouses in Muker parish. We’ll match the stories and memories on each panel with the locations they are going into. Keld Lodge for instance, has a lovely picture window in its guest lounge with views towards East Stonesdale farm. We’ve recorded the memories of the farmer that worked there as a young man and so we’ll use a selection of these on their panel. Kearton Country Hotel is based in Thwaite and luckily we have some wondeful recordings from a retired farmer and his wife who still actually live nearby. The rain has been falling pretty relentlessly this week and we noticed a few days ago that some hay had been cut near Thwaite, then gathered into pikes and covered with tarpaulins to protect it. A major part of the Every Barn Tells a Story project is the production of videos recording the best memories and some of the history of the cowhouses around Muker parish. We have already appointed a film maker to help our in house staff and they have been out and about capturing the glory of the haymeadows before the rain set in. Yesterday we travelled over to York to visit the team at the Yorkshire Film Archive to have a look through some of their footage with a view to incorporating archive clips into our own footage. We’d already viewed a film in the collection called Dale Days online here . This was filmed in 1940 by Charles Chislett and shows a group of four children on an idyllic holiday in the Yorkshire Dales. They seem to have been based in Bainbridge in Wensleydale, but make at least one trip over the Buttertubs Pass into Swaledale. We loved this clip of a farmer carrying a rather heavy backcan full of milk up Hunger Hill, Faw Head, near Gayle in Wensleydale. Later on there is a long sequence showing a farmer handmilking Northern Dairy Shorthorns in a cowhouse and then following the milk in churns to the creamery in Hawes where it is made into cheese. Scenes that would all have been very familiar to our farmers in Swaledale in the 1940s. We also saw some superb sequences of early haymaking in the Dales including some on original film stock from an old collection which we have arranged to have digitised for the project. All very exciting, so a big thank you to Graham Railton and the team at the YFA. We have come across a wonderful book called Swaledale Wills and Inventories 1522-1600 edited by Elizabeth K Berry and published by the Yorkshire Archaeological Society in 1998. It opens a fascinating window onto the lives of people living in the dale during the Elizabethan era. There are no mentions of cowhouses around Muker which was a bit disappointing, though further down the dale at Hudswell, Ciciley Thomson’s inventory of possessions includes ‘five spayned [weaned] calves in ye laithe’ (no 180 dated 1592/3). Laithe is a word used for barn or cowhouse in other parts of the Yorkshire Dales. The only possible barn in the Muker area was mentioned in Simon Alderson of Keld’s will where he leaves his ‘fermhould greinge’ to his son Simon (no 121 dated 1577). A grange can mean a barn (literally, a granary) or it can mean a farmhouse with buildings attached. Stacks of hay however are mentioned a lot, they clearly formed a noteworthy part of someone’s wealth. The inventory of John Rawe of Ravenseat’s possessions included ‘Item a stack of hay and a peece of another’ worth 20 shillings (no 204 dated 1598). Phyllis Alldersonn of Thwaite had ‘Item haye’ worth £3 6s 8d (no 209 dated 1600). Even more important were the beasts. Cattle are head and shoulders above sheep in terms of their value. The various types of animals are also carefully listed and priced accordingly. Edmund Harcaye of Thwaite lists ’11 kyne [cows] and one wheye [a heifer or young cow of up to three years old or until calved]’ worth £16 16s 8d – the most valuable things he owned. Plus ‘one bull price 26s 8d’. Then ‘8 stotes [young male cattle one to three years old]’ and finally ‘8 twinter [two year old] stotes and wheyes’ (no 177 dated 1591). It’s not clear if these animals are for meat or milk, however, many inventories list dairying items so we think most were kept for the production of butter for sale and cheese for the household. John Rawe mentioned above was a husbandman which means he didn’t have his own farm. His inventory shows he wasn’t a wealthy man, he has one sheet and ‘a sacke’ listed, but he does have three cows and two calves along with ‘a chirne [butter churn] and towe old kittes [a wooden vessel for carrying milk and butter among other things]’. Sharing the stories we have collected about the cowhouses in Muker parish is what this project is all about now. Our first two outdoor interpretation panels are now ready to be signed off for production. 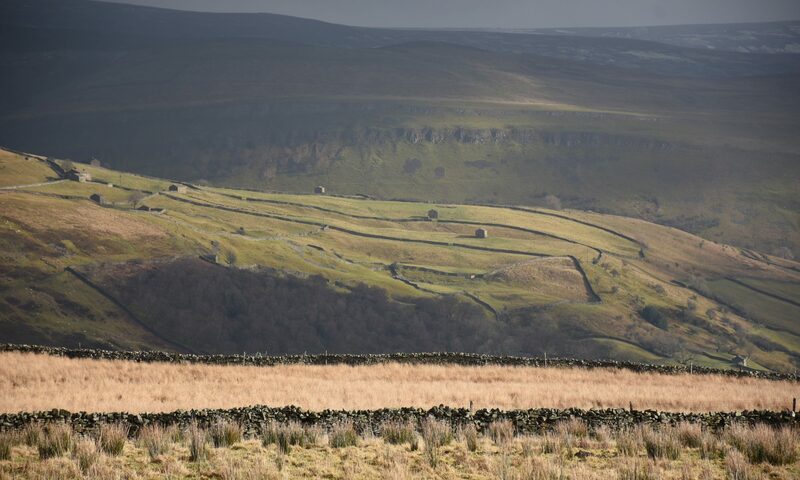 They have been specifically designed to go into two visitor businesses in the area – Usha Gap campsite and Swaledale Yurts after we consulted with the owners about what would suit them best. Both sites have a farming background and we were lucky enough to collect stories about cowhouses specific to each location. The next step is to get the kids to produce the illustrations and words for the leaflet. Glenda is also organising a haytiming day where the children will get a chance to practice strewing the hay with special child-sized wooden hayrakes, building haycocks and then trampling hay down in the mew. Our research into the Rievaulx Abbey documents has thrown an interesting light on what farming looked like in Swaledale in the medieval period. Hay and the meadows it was grown in were clearly important but so too was the right to graze animals in what we call ‘wood pastures’ on the hillsides and this included cutting branches off trees so animals could eat the leaves. Ivelet Wood just across the river from Muker has been identified as an original piece of wood pasture which was ‘common’ or shared land where, from the earliest times, commoners had the right to graze their stock and also have access to woodland to supply firewood and sometimes timber. As grazing pressure has reduced on this relatively remote steep valley side, the trees have become more dominant. Part of the grant of land in Swaledale to Rievaulx was the right to lead cattle to and from the wood pastures so long as they avoided going through cornfields and meadows [segetibus et pratis]. Given that they were also given the right to catch wolves it’s possible that cattle were only grazed out during daylight hours and brought back into the safety of shelters called lodges in the document [logias]. A party of national park staff went out on a working holiday to a village in Romania earlier this year and they found that the villagers look after their cows in exactly the same way – leading them out in a communal herd in the morning and then bringing them back and letting them make their own way to their individual cowhouses at night. They even cut branches off trees as fodder. There the danger is from bears as well as wolves! Find out more about historic woodland in the Yorkshire Dales on our Out of Oblivion website. “To the Abbot of Rievaulx. This is fascinating because it seems to imply that there is housing – folds and lodges – of some sort – for animals, separate to the housing [domibus] for the lay brothers, servants and other animals. This is even more interesting because here the term ‘animalis‘ is replaced with the term ‘pecoribus‘ which our research tells us usually meant larger herd animals but not beasts of burden like horses or oxen so we are possibly looking at cattle, ‘faldas et logias pecoribus‘ may therefore mean ‘folds and houses for cattle’ rather than (or as well as) sheep which is what has been assumed up to now. There is also again the distinction between these, and the housing for the lay bothers, servants and their animals which we might assume are the nucleated farmsteads we still see today often with animal housing under the same roof as the farmhouse itself. We’re now hunting for a Latin scholar who can check what we think we’ve discovered! Many of our cowhouses lie in what are called ‘intake’ fields such as the one in this photo near Keld. The name ‘intake’ has a particular meaning. It refers to land that has been literally ‘taken in’ from rough hillside pasture and moorland. It would have been drained, the largest stones picked off, mowed, spread with lime burnt in lime kilns on the hillside above and manured. Eventually, after a lot of hard work the coarse moorland grass, rushes and heather would have been replaced by sweet meadow grass and flowers. We think that the meadows on the opposite side of the dale at this point (where the main road and farm houses lie) were the first to be farmed. The intake fields on this side of the dale are later, turned into meadows maybe sometime in the late seventeenth or eighteenth century when using lime to improve pastures became widespread. Chris Calvert’s uncle farmed these fields from Thorns across the valley. Chris remembers looking after cattle in these cowhouses when he was younger and why they are now mostly redundant.